CCRA publishes the Center City Quarterly to provide information on Center City people and events from the point of local residents. You'll be guaranteed to learn something interesting about your neighborhood in every issue! Archived issues of the Quarterly are provided in Adobe Acrobat format. If you do not have the free Adobe Acrobat reader, you can download it directly from Adobe. Advertisers: To advertise in the Center City Quarterly, download our AdvertiserForm and email the completed form to centercity@centercityresidents.org or return to us by mail with your payment. Upon receipt of your completed form, a member of the Newsletter Committee will contact you regarding any specific requirements. Feet First Philly is Philadelphia’s pedestrian advocacy group and a project of the Clean Air Council. Feet First Philly raises awareness of issues facing pedestrians in the City of Philadelphia including improving the pedestrian environment, protecting the rights of pedestrians, and encouraging walking as a mode of transportation, as well as for exercise and recreation. Feet First Philly leads multiple advocacy projects including the #NotaParkingSpot campaign on Twitter. The campaign calls for better enforcement around parking on sidewalks and crosswalks, and empowers pedestrians to document illegal parking in their neighborhood. Because it leads to unsafe crossing of intersections and forces pedestrians into traffic, parking illegally can end in serious injury and even loss of life. Feet First Philly’s goal is to make Philadelphia’s streets safe and accessible for everyone. Feet First Philly also leads organized walks, keeps a monthly walking calendar, conducts walk audits, and is a member of the Vision Zero Alliance, working to end traffic deaths in Philadelphia. Are you interested in getting involved with Feet First Philly? Do you want to stay informed of our work or volunteer with us? Email us at feetfirstphilly@cleanair.org today! Learn more about Feet First Philly at https://feetfirstphilly.org/. PHILADELPHIA – Streets Commissioner Carlton Williams announced today that evening street improvement work in the Center City area beginning Monday, July 23 at 7p.m. The work is expected to be completed by early August. Weather or special events in the area may alter the work schedule. Work will be completed in separate phases – street milling, the adjustment of manhole covers, and the resetting of utility boxes. Operations for the milling work will be performed between 7p.m. and 5a.m. Milling of each street segment is expected to last approximately 1-2 nights per street. Work for the adjustment of manhole covers and the resetting of utility boxes will be scheduled during the day, between the hours of 7a.m. and 4p.m., and is expected to last approximately 1-2 days per street. Schedule of operations for the final paving of these streets will be announced when the schedule is available. To complete the work, motorists should expect parking restrictions. temporary ‘No Parking’ signs will be posted in advance of each scheduled activity. Motorists are urged to move their cars from the work sites when temporary ‘No Parking’ signs are posted, so that vehicles are not towed. In the event a car is towed, please contact your local Police District to determine its location. Motorists are advised to allow extra time when traveling around the work areas. The work is being completed by Tony DePaul & Son. The project is being financed with 100% City Capital Budget Funds. While the Streets Department will make every effort to minimize disruption to traffic, citizens are urged to plan ahead and use alternative routes when traveling in these areas. The Streets Department thanks citizens in advance for their patience and cooperation as we work to improve city streets. For more information on the Streets Department’s paving Program, please click here. Citizens may also contact the Streets Department’s Customer Affairs Unit at 215-686-5560. For information on all City services, please call 3-1-1. 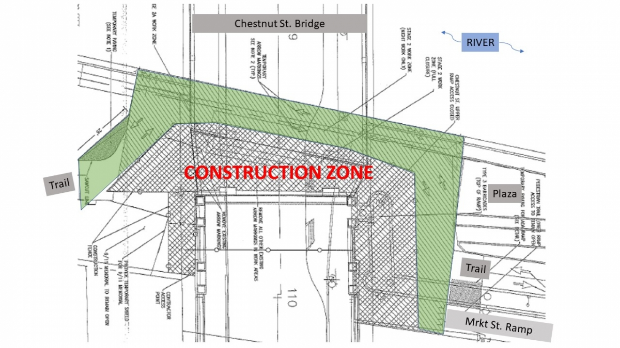 PennDOT will soon be performing much needed repairs to the Chestnut Street Bridge. As part of this work, the contractor needs to make some masonry repair and repointing of the piers and abutment - the structural support of the bridge. To do this, the current north-bound trail traffic will be combined with the south-bound trail traffic (see drawing below). The abutment repairs are expected to take place in the next two to three weeks, during which time PennDOT will do their best to keep the trail open as much as possible. The bridge reconstruction project includes new fascia lighting of the structure, a new trail pergola entrance at Chestnut Street and a new plaza on Schuylkill Avenue. The existing sink hole (located just south of the Chestnut Street Bridge in the south-bound lane) will be temporarily covered with a steel plate and asphalt during the initial phase. PennDOT has incorporated the permanent repair of this area into their contract and work is expected to take place this winter. There will be a short period of a month or two when a complete closure of the trail will be needed. A detour for trail users through the street network will be posted. This closure is unavoidable, but is being scheduled in the winter when trail traffic is lower. We ask all trail users to exercise caution while negotiating this area over the coming months, and we appreciate PennDOT's support of our efforts here. We attended the Market-JFK Vision Zero Safety Project Steering Committee earlier this week. The meeting was convened by Philadelphia’s Office of Transportation and Infrastructure Systems, (OTIS) and included major property owners and stakeholders along the Market and JFK corridors. The Philadelphia Police Department 9th District and Philadelphia Parking Authority have begun three education and enforcement actvities as part of the pilot, as requested by the Councilperson. If you see a recurring problem, please tweet @philaparking and/or email a message to otis@phila.gov. Please cc: centercity@centercityresidents.org on any emails so that we may track our residents' concerns. The pilot is expected to last 9 months, and OTIS will be collecting a variety of data in both July and September/October to evaluate the bike lanes on a number of measures. A few weeks ago, a large number of homeowners throughout the City of Philadelphia received notices from the Office of Property Assessment (OPA) that their properties have been reassessed. In many cases, the reassessed values increased substantially. Since property taxes are based on OPA's assessment valuations, it follows that many homeowners are likely to see an increase in their property taxes in 2019. Because many people in Center City have questions about the reassessment process and want to know how to appeal, CCRA held a public meeting last week at Tenth Presbyterian Church. A panel consisting of Michael Piper (Chief Assessment Officer for the OPA), Salima Cunningham (Communication Coordinator for the OPA), and attorney Stewart Weintraub fielded questions from a packed audience. For information about that public meeting, check out this article from Philly.com reporter Erin Arvedlund. Property owners who want to challenge their reassessments can file for First Level Review (FLR) with the OPA. FLR is not an appeal, but rather is an informal process where property owners can provide information to OPA suggesting that their assessments may be incorrect, and if the OPA agrees, it can change the assessment. Requests for FLR are due no later than May 25, 2018. If you need a FLR form, either reach out to CCRA or call the OPA at (215) 686-4334. The deadline for taking a formal appeal is in October of 2018. In requesting FLR, property owners are permitted to be represented by attorneys. However, representation is not necessary. While there are several factors that the OPA will consider in making a decision to change an assessment on FLR, one thing that the OPA unfortunately will not entertain is the property owner's ability or inability to pay his or her taxes. In reviewing an assessment on FLR, OPA will consider the valuation of comparable properties. However, there is no simple definition of what constitutes a "comparable" property. If you did not receive a reassessment notice in the mail and you are unsure if your property has been reassessed, call the OPA at (215) 686-9272. If your property is owner occupied you may be entitled to a homestead exemption. Click here for more information. Penn’s Village helps Central Philadelphia seniors stay in their homes by linking neighbor to neighbor to help with transportation, chores, and medical visits, and provides social and educational programs. To learn more visit www.pennsvillage.org or call 215-925-7333. Keeping Up with Evolving Technology, a two event program, May 23, 2018, in the MacColl Room of the First Presbyterian Church, 201 South 21st Street. Attendees can select one or both programs. What Voice Command Devices Can Do for You, 2:00 PM, Mario Orpeza will remove the mystery and give practical tips for their use. Tips for Apple Cyber Seniors, 3:30 PM, Yoav Zohar will help owners of Apple products (iMac, iPad and/or iPhone) get the most from their devices. This program is free for Penn’s Village members and volunteers. A $5 donation from other guests would be appreciated. · Putting Your Values on Paper, 2:00 PM, Stevens Community Center of the Lutheran Church of the Holy Communion, 2110 Sansom Street. • Hello, Tuesday, May 22, 2018. Janet Burnham will lead this conversation game that is a fun way to begin a meaningful conversation about living, dying and what matters most. The cost of the Hello Game is $5 for Penn’s Village members and volunteers (to cover the cost of game materials); $10 for other guests, payable at the event. • Ethical Will, Tuesday, May 29, 2018. Marianne Waller, a personal historian, will lead a workshop providing practical guidance in developing what is often called an ethical or spiritual will. This workshop is free for Penn’s Village members and volunteers. A $5 donation from other guests would be appreciated. Guests are welcome to attend three Penn’s Village programs before becoming a member and/or volunteer. For all of the above Penn’s Village programs, please register by emailing info@pennsvillage.org or calling 215-925 7333. Penn’s Village helps Central Philadelphia seniors stay in their homes by linking neighbor to neighbor to help with transportation, chores, and medical visits, and provides social and educational programs. To learn more visit www.pennsvillage.org or call 214-925-7333. What Children’s TV Tells Us about Ourselves with Jo Holz, 2:00 PM, Wednesday, May 9, The Athenaeum, 219 South 6th Street. The handicapped entrance is at the rear of the building. Please note for this program there is no charge for Penn’s Village members and volunteers, but a $5 donation is requested for other guests. Tea, Scones & Work with Your Phones V, 4:00 - 6:00 PM, Friday, April 27, Community Room, Society Hill Towers, 261St. James Place. The Declaration, the Constitution and American Identity: A Contrarian View with Kermit Roosevelt, 6:30 -7:30 PM, Wednesday, April 25, in the lower level meeting room, Philadelphia City Institute Library, 1905 Locust Street. There is no elevator to the lower level. Philadelphia Mansions with Author Thom Nickels, 6:30 - 7:30 PM, Monday, April 30, in the lower level meeting room, Philadelphia City Institute Library, 1905 Locust Street. There is no elevator to the lower level. For all of the above Penn’s Village programs, please register by emailing info@pennsvillage.org or calling 215 925 7333. Pennsylvania’s primary election will be held on Tuesday, May 15th, and only registered voters are entitled to vote. The deadline to register to vote in the primary is April 16th. In Pennsylvania, you can register in person, by mail, and at various government agencies. Information on how to register is at https://www.philadelphiavotes.com/en/voters/registering-to-vote. Primary elections are important because the winners will be the candidates in the general election November 6th. Parents of college students please remind them that they can register to vote where they attend college, or they can vote in Philadelphia by absentee ballot. Therefore, it is important to register to vote at the location at which they want to vote – at their college location or at their home address. Don't Overfeed the Big Belly! CCRA is working with the Philadelphia Streets Department to try to resolve problematic Big Belly garbage cans in our neighborhood that frequently are overfilled to capacity. In the meantime, we ask that you do not add to the problem by putting household or other trash outside of or around an overly full Big Belly! This is not only a quality of life issue, but it is also a public health and wellness issue. If you see someone adding to the pile, please ask them to stop and think about it and take their garbage home or to another trash can. You can also use 311 to report issues of concern that are not a crime in progress. If you are aware of a Big Belly trash can near you that continues to be overfilled, please reach out to CCRA at centercity@centercityresidents.org to let us know. Center City has a large number of talented amateur and professional photographers. Share your images of local events and sites. We reserved the right to scrub any images we consider offensive. All copyrights are reserved to the contributor, who grants CCRA the rights to display images uploaded in this web site. No commercial information, please!